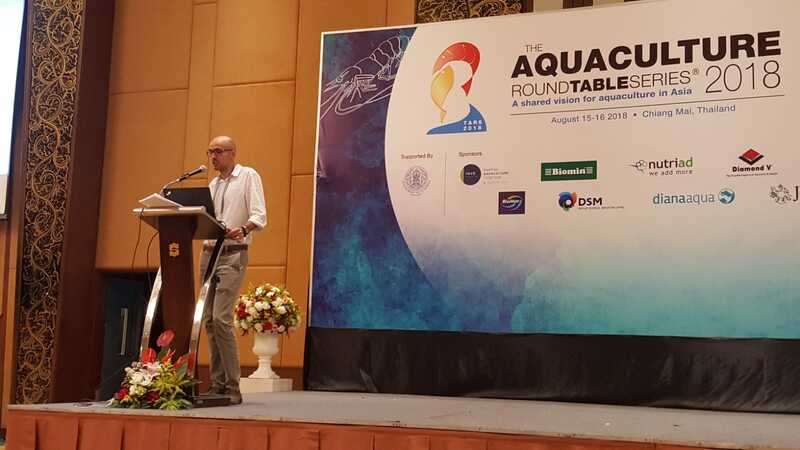 Multinational feed additives producer Nutriad, pioneer in species specific additive solutions in aquaculture, one more sponsored The Roundtable Aquaculture Series (TARS) which was held in August in Chiang Mai, Thailand. The theme of TARS 2018 was Shrimp Aquaculture: Need for Change and Nutriad specialists presented views on the use of novel feed ingredients and additives to improve nutrition and health in shrimp production across the world. With over 250 aqua attendees, TARS 2018 attracted international and regional aqua feedmills, including Cargill, CPF, Thai Union, Thai Union, TRF, Gold Coin, DeHeus, Biomar, as well as farm owners and major suppliers in the region to share updates and experiences and explore workable solutions towards increasing efficiency in shrimp farming. “Low Shrimp pricing is the main issue producers are facing this year, but we believe that we can still manage feed cost through innovative nutritional approaches,” said Dr. Fai (Poonmanee) Kanjanaworakul, Technical and Commercial Manager Aquaculture, Nutriad Asia Ltd (Thailand). “In the past few years, farmers have managed to offset increasing production costs with strong global shrimp prices. At TARS, the industry sector advocated for an aggressive Need for Change towards more efficient production in order to sustain profitability of shrimp production,” says Allen Wu, Aquaculture Manager APAC for Nutriad. Dr Waldo Nuez, Nutriad´s Aquaculture Lead Scientist, shared his views on the potential of novel feed ingredients and functional feed additives to upgrade the current nutritional and functional value of shrimp feeds. His presentation received special attention and questions from participants, particularly feed producers, aiming to secure production efficiency and good health of shrimp by improving their formulations. “Traditional plant ingredients, novel oils and protein sources will improve the inputs of some but not all essential nutrients, so functional feed additives aiming to maximize the efficiency of absorption and utilization will be key to extract more nutritional value of each kilogram of feed,” said Dr. Nuez. ARE YOU MEETING THE NEEDS OF TODAY’S EVER DEMANDING CUSTOMER?